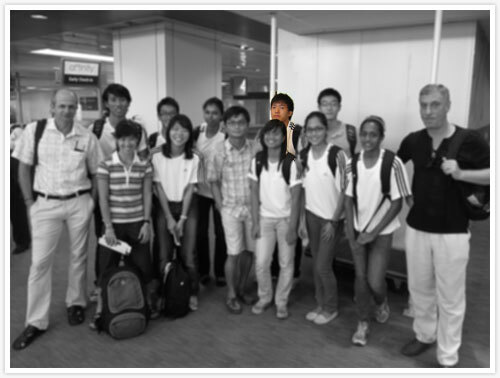 Wong Kai Yuen, in the back, fifth from the right, at Changi Airport before his flight to a junior competition in Thailand, the 5th SEA Junior. At the recent 5th SEA Junior held in Thailand, our top junior shot put athlete, Wong Kai Yuen broke the junior record (6kg). It was previously held by Scott Wong that was set back in 2008. Wong Kai Yuen new effort of 15.26 meters at the Thammasat University Sport Complex, Bangkok, erased the old mark of 15.14 meters by Scott Wong. The 16-years-old apart from holding the junior record in the boy’s shot put, also holds the under-17 record in the same event. Below is a recent interview of the youngster regarding his foray in athletics. Coach: Mr Elangovan (2003). Mr Chu Seow Beng (2004 – 2006) Right now I’m officially coached by my school coach (Guo Huai Yun) but for the past 4 – 5 months I have been getting quite a lot of help from Mr James Wong and his wife coach Jana too. I started athletics back when I was primary 3 (9 years old) in Pei Hwa Primary. Back then, I think I joined the CCA because my friends were joining it too. We liked playing football a lot, but since there wasn’t a soccer CCA, we joined track because we got to play a lot of football during training. When did you start specializing in the shotput event? End of my primary 5 year (2005). Was your record at SEA Junior expected? More or less. Though my performance speaks otherwise, I have been averaging high 15’s meters and some 16’s meters effort during training. But unfortunately I had quite a large dip in form about 2-3 weeks before SEA Juniors and wasn’t quite able to return to top form. So I guess I could only settle for barely breaking the record. My coach says I was quite overworked and tired, hence the dip in form. Wong Kai Yuen (second from the left in the back) attended a recent workshop by Valerie Adams, the World and Olympic women’s shot put champion. He commented the workshop was insightful, and has gained lots of insider scoop into top level shot put. What was your thoughts on breaking Scott Wong’s shot put junior record? There wasn’t much going on, mostly just wanting to return to Singapore quick so I can start off quite an important off-season training period for the things going on in 2011. But still the feeling was bitter sweet, being that I performed poorly yet I couldn’t complain since I had a record. Oh yeah, and the $300 (reward for breaking the record) would of course be of great help for my training and development. Right now its everyday, about 10-12 sessions a week (2 – 2.5 hours each session). I think it’ll probably increase soon though. There’s different sessions, like technique and throwing sessions or gym sessions. It’s balanced out within a week, and there’s quite a bit of sprints, jumps, medicine ball and other athletic training stuff too. Wong Kai Yuen pictured seen at the bottom right, featuring an old photo of him at the ASEAN School Games back in 2009. How do you juggle studies, training, competition, competing overseas? I might say I’m not too good at this unfortunately. Training and competing are fun so they aren’t a problem. But studying isn’t so I guess I dun get to do much of that. I try to listen in class though so I don’t have to do as much studying at home. Does your school recognize your talent, and provide any support in any way? I guess the best support provided is my coach (Guo Huai Yun), and of course the necessary training facilities. What are you currently improving on your shot put? Everything. Technically I’m quite sound, but there’s still quite a bit of changes and improvement I have to make. For power, strength, and speed it’s always good to have more, maybe more for me since I’m on the smaller side. Other than “just out of NS”, hopefully its at the Asian Games or Commonwealth level. Probably not a podium finish yet, but getting to the final would be possible. I wouldn’t want to rush this though, it’ll depend on how i develop over the years. Maybe top 3 at the Commonwealth Youth games and at least a top 5-8 at the World Youth next year. It’ll depend on the competition. Going over 20m (5kg) would probably be needed, which is quite a realistic short term goal for next year actually.